SITREP BackerKit / Ti5 / Straps / & More | Redux & Co. Wish Kid wants to fly a fighter jet! We continue to gain momentum in our production operations. Our field agents now visit our manufacturer facilities on a periodic basis to follow progress, provide status updates and provide mission critical direct links to our industrious watchmakers and other partners. There’s so many fronts on this phase that this update went on much longer than expected. So grab a beverage, and buckle in. Kickstarter transferred funds via Stripe and we have been working closely with BackerKit to optimize the survey for you. We expect this to land Monday or Tuesday. One exciting update on this front is we have decided that because of some added flexibility in our supply chain plans, we have enabled titanium grade mixes for backers. That means if you initially requisitioned a COURG in Ti2, you may now add a Ti5 variant as well in your BackerKit survey. Same for backers at multiple unit orders. Bear in mind that when you add a Ti5 variant, there’s an estimated additional 15-day departure delay as previously discussed (see below for further details). Bear in mind that the images provided in the BackerKit survey are all prototypes and certain details will change as we move into final production. For example, the leather straps will include a hot stamp brand towards the tail, and the rings will change to titanium (refer to below for further detail). And for the colors of the leather straps, we’ve done our best to color correct, but it’s impossible to account for color variation across monitors and ambient light. Once the BackerKit surveys land we’ll keep the response window open for roughly 3 weeks and will provide the exact deadline. In order to move ahead with full production and keep to our timelines, we will start finalizing our specific order quantities as soon as we receive order quantities in waves of 300. Backers who do not respond within that window will have the orders held for later in the production run so as not to delay the entire fleet formation. With the new manufacturer in place, we’re making solid progress on the molds, and these are expected to be complete around the end of this month. The titanium grade 2 prototype lands first, and then two weeks or so later, the grade 5. Here’s the first step in the process — these are the brass CNC’d precursors that help form the molds. We distilled the aircraft inspired VIN plate design to its core elements and left room above and below for people who’d like to engrave their COURG. Much gratitude again to case back flight lead Halford for his phenomenal work that made this a reality. Our field operatives secured samples of titanium grade 5 blanks for comparison of finishes. The grade 5 samples in the middle row below demonstrate the difference between a bead blast and a more typical finish used. Looks to me like the brushed/more polished finish has the effect of brightening the metal to almost to the point where I might mistake it for stainless steel. On the other hand, the bead blasted grade 5 effectively looks quite similar to the grade 2 with a deeper blue-gray tone. Of course, we won’t know for sure until we receive both prototype cases. As you know, our Kickstarter flight plan did not originally include building COURG from titanium grade 5. But as #COURGcrew grew and mission control fielded requests for the upgrade we queried our manufacturer, which quoted us and said they could machine grade 5 on initial tests with up to 15-day lag. After we pushed back from the Kickstarter gate and started more in depth machining tests for the grade 5 more recently, their machines could not handle the harder titanium and required multiple repairs. It became clear that the delays could add up to more than 4 weeks. Based on that intel, we immediately diverted our attention to identifying new manufacturers who had a proven track record of manufacturing grade 5. In fact, we already had 3 other companies that we’d worked with and bid on the project before we launched our Kickstarter campaign and had mentioned grade 5 capabilities. This is where we thank the good Lord for field agents with over a decade of experience in the watch industry and manufacturing. They flew into the fray and negotiated a new agreement with one of the most respected firms in the industry in an unbelievable timeframe so we could stay the course. The one caveat to this is that since our quantity is now split between two manufacturers, we have less of a price break and the cost per unit for grade 5 upgrade is 35USD. However, a nice benefit to this new arrangement is this means that grade 5 manufacturing will run in tandem with grade 2, and we’ll be able to stay within the originally stated added 15-day window with expected arrival times by end of December / early January. I’m optimistic they could deliver earlier than expected so if they make better progress than expected, we’ll gladly relay and update flight arrival ETA. We spec’d brass movement holders because I’ve heard anecdotal evidence of instrument failures cause by cheap plastic movement holders that warp or deform over time and cause problems for the mechanism. With that in mind, we’re also consulting with our Seiko/SII representative about what other measures we can take to further improve shock protection such as an elastomer ring or other material within our timeline. Bear in mind that the NH35 already has the proprietary unbreakable Diaflex mainspring and a shock-absorbing mechanism called Diashock, which was based on Incabloc and has a long proven tour of duty and gained wider use in the 1950s as soldiers looked for more dependable mission critical instruments. As you know, I’ve been in close discussions with the team at Worn & Wound on this exclusive strap. We will produce custom leather dies just for this strap to enable three rings instead of the leather loop that I’ve found migrates off the tail in the field. I know there’ve been requests for XL straps. And I’ve chatted with the W&W team about this. As you know, they currently do not offer any of their straps in XL. And currently, our Horween strap design could fit up to a 9-inch wrist at the last hole, but the tail would be quite short and not reach the next metal loops. I want to make this happen and leave no man behind on this, but we need a critical mass of orders because this maneuver requires making an extra, quite expensive custom die to slice the leather longer. We’ll need at least 60 backers willing to commit to the XL to make this feasible. Survey lands early next week, so BackerKit HQ needs to know ASAP whether to include an XL Horween option. So, any votes over the weekend would go a long way: VOTE. We’ve been working out the timelines for these straps and their projections will depend largely on our order quantity. We’ve committed to order roughly 300 straps between the Color 8 and Natural brown. They will aim for December delivery as well, though some amount of those may arrive in the new year. For contingency, if some straps are delayed, in order to save money on shipping for you and also duty/tariffs, we will keep your order in a holding pattern so everything ships together. We’re forging ahead with plans to upgrade all hardware across all the COURG straps to bead blasted titanium grade 2. We don’t believe there will be a significant enough difference between the colors in the watch if you go with grade 5 in the case. My goal is to make hardware that will not be too tall (current rings flop around and often leave too much space). At the same time, my goal is for the hardware to double as both strap loop and buckle. The reason I want to avoid the standard buckles is that those are typically secured with — you guessed it — shoulderless spring bars that are a potential point of weakness. With that in mind I wanted to add a touch of refinement to the standard and ubiquitous round loops but not be too dainty feeling like some of the existing “NATO” style hardware . Also, it needs to work for three strap types and materials (WWxRDX 2mm, ballistic nylon ZULU, 1.75mm leather ZULU). I’d originally planned to design hardware that would require new molds. The downside to this is we’d need time for tooling and additional machining. Then we’ll have to have prototypes of the straps made to make sure all the dimensions translate from HQ into field ops. The other option I’ve mentioned previously is to go with pre-formed titanium rods bent into shape. We can accomplish something that approximates my design with this method and have just about no loss in hardware integrity (if you somehow manage to bend these hardware rings, you’ve probably got bigger problems to worry about). The benefit to this is we won’t have to make molds and will have less concern for manufacturing delays on this front. Going with the bent rods also means we may be able to upgrade every strap we ship to titanium hardware because costs could be lower. I’m working with the manufacturer to determine timelines to make a final call once I receive samples of the formed hardware. As much as I would like to have these new rings made in time for COURG deployments to your outposts — I’ve decided to prioritize delivery timelines over this detail. So, if I find that the optimal mix of shape and speed means we go with the formed rings instead of molded, we will forego the molded hardware for this maiden voyage. I promised to do everything within our power to deliver by end of the year and so my order of priorities begins with no compromise on COURG build quality. 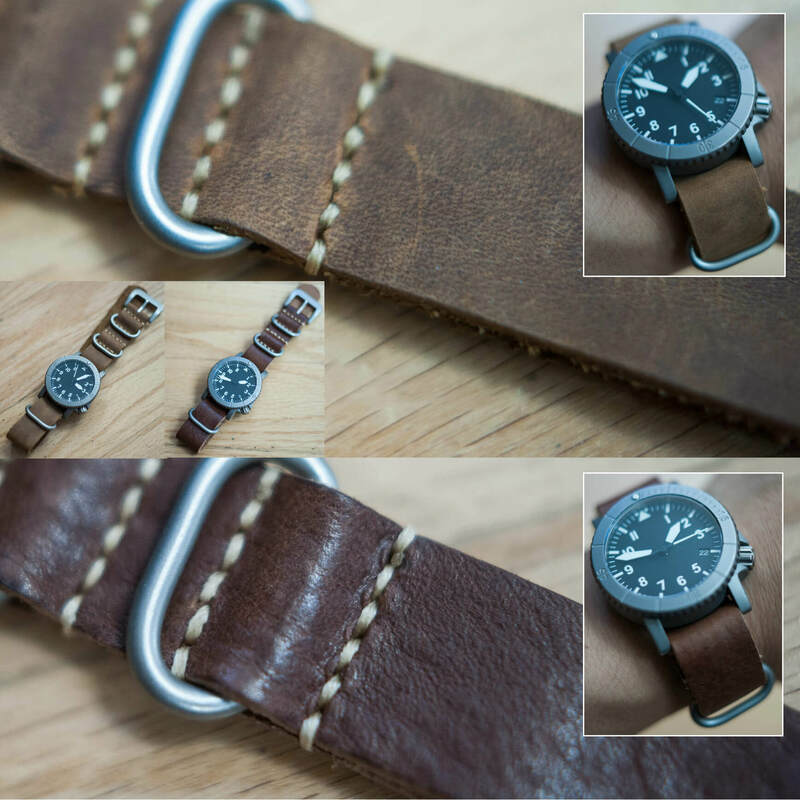 And then bigger qualitative upgrades such as titanium grade 5 or the handmade Horween leather straps within reasonable and fully disclosed timeframes. But nice-to-haves must not add any further delays. In order to test and finalize the prototypes for pressure ratings and ensure we’ve accounted for everything before going into pre-production mold we had sent one of the prototypes for QA to 20 ATM. We found that the current configuration will not withstand 20 ATM. In order to withstand 20 ATM, we have two choices: Increase the dimensions of the watch to 41mm and reduce the crystal diameter by a millimeter or stick with 39mm and reduce the crystal diameter by 3mm. I realize those size changes may not sound like much but in the watch world, those numbers mean significant modifications to the aesthetic and look of the bezel, the dial, and the hands. I’m disappointed that the 20 ATM does not seem to be a possibility right now, but I decided that rather than drastically change the size and/or current configuration as designed, we will maintain our course headings and pursue the original 39mm spec. and dimensions with pressure tests that push 18 ATM. We’ll test once again after we have the new prototypes made with thicker sapphire. In the meantime, we’ve begun discussions to partner with Make-a-Wish foundation to sponsor a child from the New York City area who has cancer and wishes he could fly in a fighter jet. As I’ve mentioned, the #COURGcrew includes a number of U.S. Air Force and Navy pilots, some of who have offered to help make this happen, if needed! Thanks to each of you, I hope we can play a part in giving this little wish kid wings to be a flyboy. This mission has deep personal meaning to me because many years ago the Make-a-Wish foundation helped fulfill the wish of a special young boy in our family who wanted to visit Lockheed Martin (yes, av-geekery is contagious). He’s now on his way to college and aspires to be an aircraft engineer. Hope relaxing with loved ones is somewhere on your mission objectives this weekend. The tyke is my wingman this weekend with mama at a church retreat, wheeee! I hope we’ll be best friends one day. I’m not sure why, but this feels like a daunting mission to me right now. Godspeed. elbert, over and out.